Lil’ brownies are complete, and with that…. I have no more knitting I can show you. 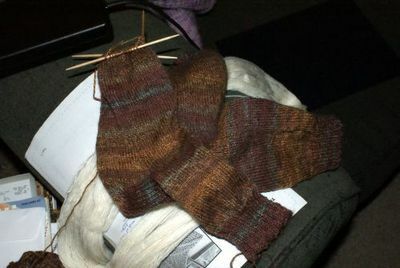 There is literally NO knitting I am working on right now (and there is a lot) that is not a Christmas present for someone who might read this blog. However, it might not remain that way. For lack of clean laundry, I have resorted to wearing some of the thrift store sweaters sitting on rip row. I may need to crank myself out a sweater to be able to hold my head high at work. (Not that anyone really cares, but it might make customers nervous to see an employee in a ratty beige sweater full of moth holes.) Also, the only warm winter hat I have left now both has a big hole AND looks like dog barf. But for me to knit something for myself, my need for warmth will have to overcome my fear of guilt at abandoning the Christmas Beasties. It’s up to the mid-60’s today, so it might be a while.